Hi All -- I'm so glad I found you. 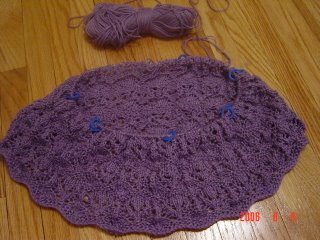 I've finished 3 rows of the lace pattern and started slowing down a bit (i.e., another yarn, another pattern caught my eye ;~})... I'm counting on this KAL to be my inspiration to finish (quickly). My LBT is in purple. I got the yarn as a Mother's Day gift (if you send them to the right LYS store with the magazine and pattern circled, they come back with something you love!). I've never worked with bamboo before and was surprised at its crunchiness. I assume it will soften once washed and blocked. I'm making the smallest size because the last couple of things I made out of IK came out way too big... I haven't taken it off the needles yet to try it on, but maybe will do so after reading some of your comments. Otherwise, I'm loving the yarn and the pattern. I created a faux-chart for myself to speed the process along (no symbols, just abbreviations). 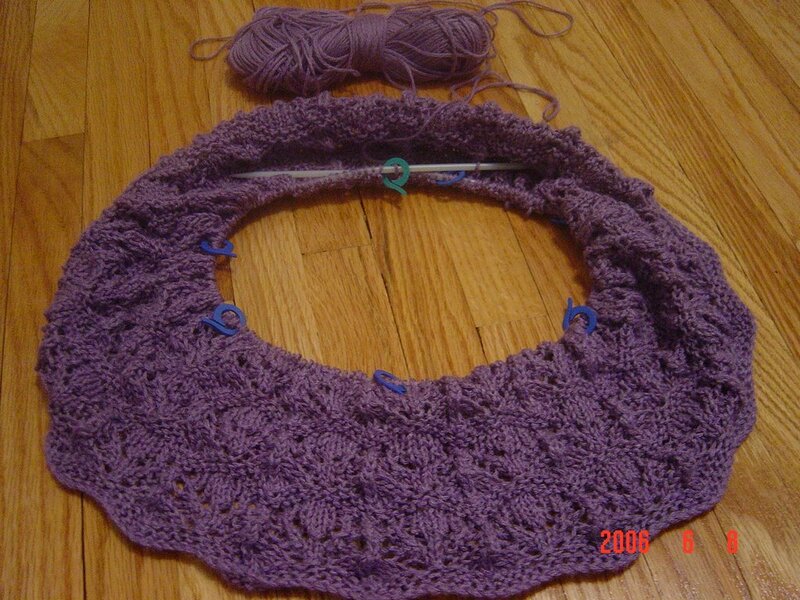 I've thought about adding a 5th repeat but am not sure (1) I'll have enough yarn and (2) I'll have enough motivation. Fortunately, I like how 4 repeats look. Anyway, here it is so far. That's such a pretty purple! I love it. My swatch definitely softened up after I washed it, so the crunchiness should abate once you wash yours.